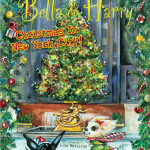 The Adventures of Bella & Harry: CHRISTMAS IN NEW YORK CITY! Ever dreamed of seeing New York City at Christmastime? The sparkling lights. The Rockefeller Center Christmas Tree. The Rockettes at Radio City Music Hall. And, of course, a visit with Santa.